As well as announcing their new IO Plus Internet Of Things feed subscription package, Adafruit has also announced the availability of the new APDS9960 Proximity, Light, RGB, and Gesture Sensor. The tiny breakout board is packed with sensors offering basic gesture sensing, RGB colour sensing, proximity sensing, or ambient light sensing all of which can be easily added to your project thanks to the Adafruit APDS9960. 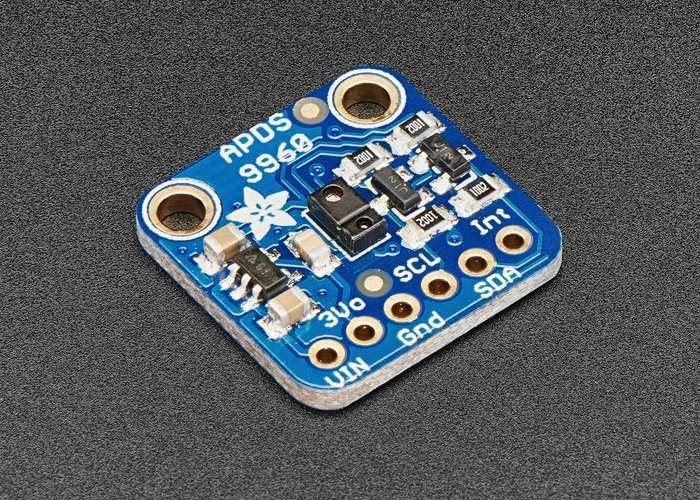 Adafruit explains more about the APDS9960 breakout board which is now available priced at $7.50. When connected to your microcontroller (running our library code) it can detect simple gestures (left to right, right to left, up to down, down to up are currently supported), return the amount of red, blue, green, and clear light, or return how close an object is to the front of the sensor. This device uses an I2C interface so it’s easy to wire up and use. The APDS9960 from Avago Technologies has an integrated IR LED and driver, along with four directional photodiodes that sense reflected IR energy from the LED. It’s proximity detection feature allows it to measure the distance an object is from the front of the sensor (up to a few centimeters) with 8 bit resolution. The APDS9960 has a configurable interrupt that can fire when a certain proximity threshold is broken, or when a color sensor breaks a certain threshold. For your convenience we’ve pick-and-placed the sensor on a PCB with a 3.3V regulator and some level shifting so it can be easily used with your favorite 3.3V or 5V microcontroller.